Lunch at jean georges in trump tower, originally uploaded by electra-cute. The bathroom was very art deco. 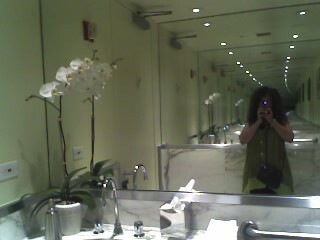 Hey any chance I have to take a photo of a cool bathroom I’ll do it!! You always get to go to the neatest places and do such wonderful things. Been thinking about you and this trip.. and this morning when I heard about and saw pictures of the two new baby pandas born I REALLY thought about you. Enjoy your trip and thanks for sharing. We need to talk when you get home. Booked the trip to Galapagos and need help with cameras! Love the orchid!! I also love the new pendant with the face that reminds me of AKA, “Roster.” What a fun trip, and thanks for sharing. Claudia I was also thinking about you and wondering if you had left on your trip yet…YES we need to chat for sure!!! Hi Nan!! Thanks a bunch for stopping in girlfriend!!! You are right that it is very much like “Roster”!! !